A pulse laser emits a very high power beam of laser light with a duration of about a millisecond. Against soft material like flesh, the high intensity light will flash the material to vapor with sufficient violence that it will rip out a cavity in the material, flaying flesh from bone. The light beam propagates through the now-transparent vapor to the back of the expanding cavity, producing more high pressure vapor from the moving interface to drill deep into meat and organs. Incident on hard materials, the beam melts a thin layer and evaporates the surface of the melt. The high pressure evaporate jetting from the molten surface pushes on the molten layer, acting like a piston to squirt the melt layer out along the sides of the hole and producing a spray of incandescent sparks. Since melting is more efficient at removing material than vaporization, this improves the efficiency of the beam at drilling through armor. At longer range, the beam is too diffuse to cause the pulsed vapor explosion, but it still acts like a heat ray, causing melting, charring, and ignition. This Armor Divisor only applies to DR due to material toughness, strength, and general resiliance; not to sheer mass getting in the way. Hence, do not apply the armor divisor to cover DR determined from an object's HP. For military purposes, pulse lasers only have adequate range when they emit shorter wavelength beams than the default 1.5 μm near infrared. Consequently, military lasers are at a risk of causing severe eye damage to unprotected bystanders and all soldiers will be issued flash protection goggles. At short range, the high armor penetration of lasers makes them useful against heavily armored troops, while at long range the high accurace of lasers allows them to target lightly armored or unarmored locations on armored adversaries and enables precise long range sniping against unarmored targets. Eye-safe lasers may be used for close-quarters combat such as hostage rescue situations or clearing buildings or vehicles. Civilian lasers use eye-safe wavelengths. Since animals typically do not have significant armor, a pulse laser with a large focusing aperture can harvest game at respectable distances. For civilian self defense, where most attackers are unarmored and engaged at relatively close range, the low recoil and high accuracy of lasers makes them in demand. Pulse lasers tuned to green or blue wavelengths allow superior underwater performance, and are often seen at higher tech levels where other weapons have made pulse lasers obsolete for atmospheric or vacuum engagements. For every "steps" by which the laser is defocused (e.g. going from (3) to (2), or from (1) to beyond 2×½D range), you can get to one step better damage loss following the progression 1⁄10, 1⁄8, 1⁄6, 1⁄4, 1⁄3, 1⁄2, 2⁄3, full damage. Visible or infrared light cannot cause two-photon absorption, and thus can ignore this section. A consequence of all this is that ultraviolet pulse lasers are more useful in space combat than on the ground. When ultraviolet beams are used in atmosphere they make an eerie blue-violet beam, faint and whispy near the gunner but increasing in brightness as it nears its focus, with a pungent after-odor of ozone. Pulse lasers are a late TL 9 technology. Early TL 9 will still be using laser heat rays. TL 9 lasers are still relatively underpowered and bulky, and are relegated to specialist roles. Lasers see substantial improvements into TL 10, where they become widely used. Laser Pistol: An early laser sidearm. Although short ranged and rather under-powered, it may be popular among collectors and novelty seekers, as well as competition shooters who favor its high accuracy. Skill: Beam Weapons (Pistol). Aperture 4 cm. Depth of focus multiplier 0.015. Beam energy 0.15 kJ. Energy used per shot 0.4 kJ. Extra power cell 0.15 kg, $8. Heavy Laser Pistol: One of the first laser sidearms. While bulky, it packs enough of a punch to be useful at short ranges. Skill: Beam Weapons (Pistol). Aperture 4 cm. Depth of focus multiplier 0.018. Beam energy 0.2 kJ. Energy used per shot 0.6 kJ. Extra power cell 0.25 kg, $11. Laser Carbine: An early light laser longarm. It is handy, maneuverable, and accurate. Lethal to unarmored foes, it lacks the punch needed to drill through serious combat armor necessitating precision shots to weak points to overcome more heavily armored adversaries. Skill: Beam Weapons (Rifle). Aperture 5 cm. Depth of focus multiplier 0.018. Beam energy 0.3 kJ. Energy used per shot 0.9 kJ. Extra power cell 9 kg, $500. Battle Laser: This weapon may see experimental use as an infantry longarm in front line combat, but will mostly be used by specialist marksmen. Skill: Beam Weapons (Rifle). Aperture 6 cm. Depth of focus multiplier 0.015. Beam energy 0.5 kJ. Energy used per shot 1.5 kJ. Extra power cell 8 kg, $400. Sniper Laser: A heavy longarm capable of relatively long range fire, particularly if set to emit short wavelength beams. Skill: Beam Weapons (Rifle). Aperture 10 cm. Depth of focus multiplier 0.012. Beam energy 0.9 kJ. Energy used per shot 2.5 kJ. Extra power cell 1.1 kg, $50. Light Support Laser: This laser features a beefed-up cooling system and power supply for rapid fire. Largely experimental, it is not yet ready to compete with projectile machine guns. Skill: Gunner (Beams). Aperture 10 cm. Depth of focus multiplier 0.012. Beam energy 0.9 kJ. Energy used per shot 2.5 kJ. Extra power cell 25 kg, $1200. 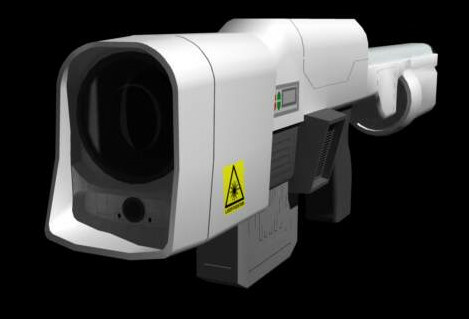 Point Defense Laser: This is the sort of weapon that may be found on vehicles needing a point defense weapon against incoming missiles, rockets, and shells. It is also useful in an anti-personnel role and can take out thin-skinned vehicles. The beam is directed through a separate beam pointer telescope, which is turreted and orients independantly of the main beam generator. Skill: Gunner (Beams). Aperture 12 cm. Depth of focus multiplier 0.018. Beam energy 5 kJ. Energy used per shot 15 kJ. Extra power cell 150 kg, $8000. Zone Defense Laser: This laser can serve for point and zone defense, as well as destroying lightly armored aircraft. It directs the beam with a separate turreted beam pointer telescope, allowing the main beam generator to be housed under heavy armor and providing a more rapid response and and agility than if the entire weapon had to be slewed to change the beam direction. Skill: Gunner (Beams). Aperture 20 cm. Depth of focus multiplier 0.015. Beam energy 12 kJ. Energy used per shot 35 kJ. Extra power cell 350 kg, $18000. Theater Defense Laser: This laser can provide support to an entire battlefield, burning down anything but the most heavily armored vehicles within line of sight. Like most other laser cannon, the beam is directed through a separately mobile beam pointer telescope. Skill: Gunner (Beams). Aperture 30 cm. Depth of focus multiplier 0.035. Beam energy 500 kJ. Energy used per shot 1500 kJ. Extra power cell 15000 kg, $700000. Recharging pack: A battery pack that can recharge power cells between firefights. It does not provide enough power to directly shoot most pulse lasers, but it can continuously provide 1 kW of power while the power cell is at less than maximum capacity, for a maximum energy of up to 5000 kJ. Divide the power supplied by the energy per shot of the laser to find the time to recharge one shot, divide the maximum energy by the energy per shot to find the total number of shots that can be supplied when fully charged. Mass: 1 kg. Cost: $100.